I watch it for the commercials. The Carolina Panthers started off the 2015 season with a win in Jacksonville. 20-9 was the final score. I didn't get to watch it today, but i heard the final minute of the game as i got off work. Panthers defense played very well, cornerback Josh Norman came up with a 30 yard interception return for a touchdown. A scary monent did happen during the game (I saw the highlights) linebacker Luke Kuechly, who had just signed a 5 year/$62 million contract a few days before the game, suffered a concussion while making a tackle. Nothing has been said as to whether he will play the home opener next week against Houston. Anyway that's pretty much it, until next week. They lost their first game again. They are doing the same crap they did last year. Playing musical Quarterback and none of them, from the starter (which they can't decide on whom is the starter) to the 2-3 backup QB, none of them are any good. They should had kept Tim Tebow! Houston at Carolina this week? Houston going to lose for sure! I knew Houston was going to lose! I watched part of the Dallas game. I am not a Cowboys fan. But still, what were they doing? Penalized 18 times? Are they a professional NFL team or where they playing grade school pee wee flag football? Houston won their first game. It's a win but their QB still looks flaky. Some great news to share here, the Carolina Panthers acquired defensive end Jared Allen in a trade from the Chicago Bears. The Panthers send a conditional 2016 draft pick to the Bears. Jared Allen has to pass a physical, but that should be no problem. So the defense just got better. When Luke Kuechly comes back from his concussion, then the defense will be even better. I can't wait to see Jared Allen in Panthers colors on the field. How are the Cincinnati Bengals 4-0? If any of you are friends with me on Facebook, then you all know just how happy i was yesterday. Panthers finally won a game over the Seahawks, payback was nice considering the Seahawks put the Panthers out of the playoffs last season. Despite 2 interceptions Cam Newton led the Panthers down the field in the last minutes of the game and connected with Greg Olsen for the winning touchdown. I'm putting up a link to that highlight. So the announcers you will hear on the clip will be the Panthers radio commentators, Mick Mixon and Eugene Robinson, i was as excited as they were when the play went down. So this is why the Bengals are 6-0. They have been playing crappy teams. Looking at the rest of the season they only have 2 worthy opponents to play against: Denver and Arizona! It's easy to be 6-0 when you have a soft schedule with 14 easy games. The Carolina Panthers won in a thrilling Monday night football game in overtime to remain undefeated at 7-0. When did the NFL change the overtime rules? It used to be the first team that scores in overtime wins. Now it's both teams get a chance at the ball and in the case of the Panthers vs Colts overtime game, the Colts scored a field goal first in OT. Then the Panthers scored a field goal to tied the game. Then the next team that scores wins the game. So if no teams scores after each possession it can go on forever until each team scores and then one team scores again in Sudden Death? I prefer the old way: the first team that scores in OT wins. It will be nice for the Texans to beat the undefeated Bengals on Monday night football but I doubt it. They should at least give their 110%. They had a bye week and being a Monday night game, they had 8 days to rest and regroup and strategize instead of 7 days. We beat the UNDEFEATED CINCINNATI BENGALS! I thought I was going to have a heart attack during the last 2 minutes of the game! Is there no stopping the Panthers? They are also the only team in the NFL that have clinched their division right now at 13th week into the season. If you told me that this was going to happen at the start of the season, I would had looked at you strangely. Are the Panthers winning because of their QB Cam Newton? If he was to get hurt, will that mean they won't have an offense anymore? How is their defense if they have to solely rely on it to win games? After watching the Panthers game yesterday, its clear they didn't play close out football. They had the Giants down 35-7 and that's what the score should've been at the end. It looked to me the Panthers weren't getting the pass rush, and getting to Eli at all in the second half. But these next two games, the Panthers better take care of the players. Cam took a hit to his shoulder, i hope that doesn't become a problem this week when they go to play the Falcons. 14-0. division champs for the 3rd straight year, and first round bye for the playoffs. Someone has to trip up the Cardinals in these last games, i want the playoffs to come through Charlotte. I would like to see Denver v Carolina. I want to say Houston just because they have never been to the Super Bowl but we all know they ain't got a chance to make it past the divisional playoff even if by some miracle they were able to beat Kansas City. 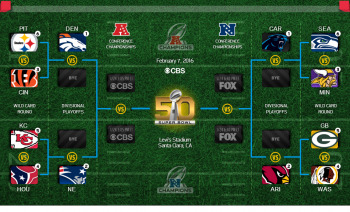 There's a lot of sites that say that the Broncos and Panthers won't make it to the Super Bowl. It just irks me the way they talk about the Panthers, no respect at all.I bet you if the Panthers don't win it all, Cam Newton will not get the MVP award. 10 Panthers got selected to the Pro Bowl, i'd like to see them all there after winning SB 50. Well, I just don't want to see those cheaters in the Super Bowl again. You know who I am talking about. They not only didn't deserve to win last year, they also didn't deserve to be in it last year because they cheated their way in with deflatagate.